Ehrlichman was officially assistant for domestic affairs in the administration of President Richard M. Nixon, but his mission was, in effect, to selectively insulate the president from the public and from other members of the government. 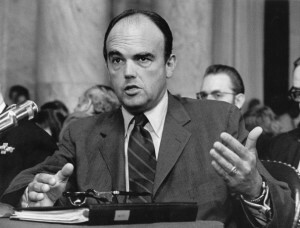 Early in the administration, Ehrlichman created a covert and illegal team of operatives he called the Plumbers, because their role was to stop information leaks. They also illegally acquired political intelligence. Ehrilchman resigned in April 1973, during the Watergate scandal, and was subsequently convicted of conspiracy, perjury, and obstruction of justice, for which he served 18 months in prison.